It was a weekend of intense focus, exhilarating races and emotions. The 2018 ForzaRC Series 1 Playoffs may have wrapped up last weekend in Seattle, WA, but that doesn’t mean it isn’t the current talking point within the Forza esports community. After eight weeks of brutal competition in Series 1 as drivers fought for their spots in Seattle, it was finally time for a champion to be crowned. With the practise laps done, qualifying out of the way, and the showdowns behind them, the drivers would hit the track once more this series for a new winner to be crowned as the spotlight shone on one of the most beloved names in the Forza community in what was ultimately one of the most enjoyable ForzaRC events to watch yet. In fact, this was the biggest and most ambitious ForzaRC broadcast to date. 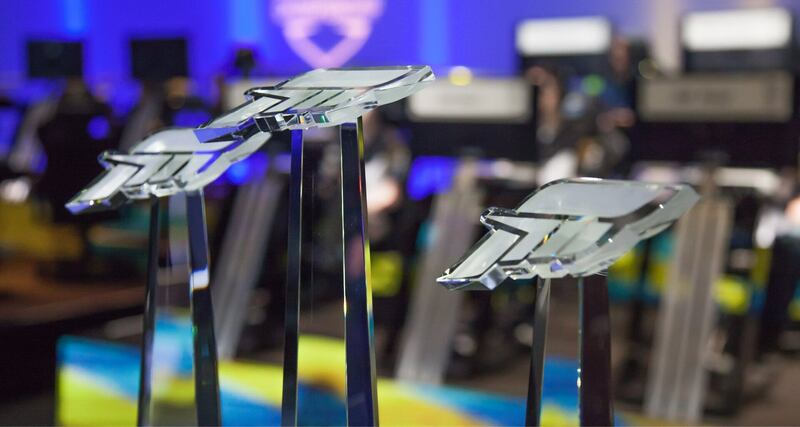 Whether it was the $75,000 prize pool, the unmissable and surprising races or the professionalism of the broadcast backed by an incredible array of talent, casters and presenters, the 2018 ForzaRC Series 1 Playoffs was the best show yet to come from Microsoft’s premier esports racing series. 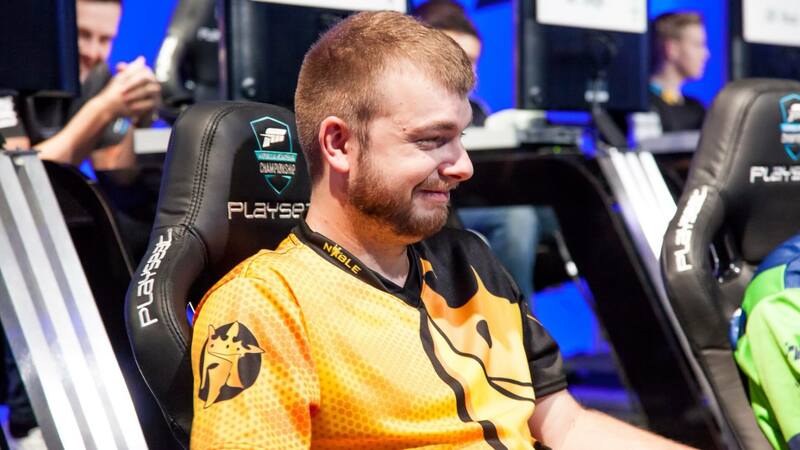 There’s no denying that it was an especially good one for Robin Betka, more commonly known as bbbb0x by the Forza community, or Noble b0x, to represent his recent team signing. His performance at last weekend’s Series 1 Playoffs was the result of hard-work, intense training and excellent consistency out on the track – and saw him go on to beat runners-up AMS RoadRunner and JSR Mitch. Betka had done incredibly well throughout most of Series 1, giving some of the best ForzaRC drivers a run for their money. By finishing at the top of the overall points leaderboard, he took home the grand prize of $15,000, whilst AMS RoadRunner earned $12,750, with JSR Mitch being rewarded with a cool $10,500. In fact, everyone who made it to the Top 12 in the Series 1 Playoffs on Sunday would be taking home prize money. However, not every driver would make the cut as more than 30 of the best racers on Forza Motorsport 7 converged in Seattle, ready to compete over two days of demanding, intense and unpredictable races. 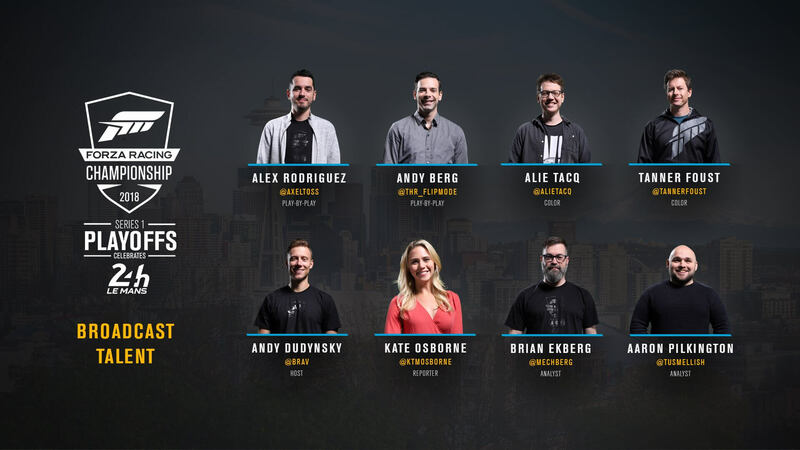 The 2018 ForzaRC Series 1 Playoffs were hosted by Andy ‘Brav’ Dudynsky, who you may recognize from the Halo community and the Halo Championship Series, as well as television host and race reporter Kate Osborne. Joining them on the casting desk for the live commentary would be Alie ‘Yachts’ Tacq of YMTVRacing, Alex ‘Axeltoss’ Rodriguez of the Rocket League Championship esports series, and professional rallycross driver and presenter Tanner Foust. Analysing the action would be Turn 10’s own Forza Community Manager Brian Ekberg with YMTVRacing co-founder Aaron Martin Pilkington – or TUS Mellish as he’s more commonly known as in the community. They would also be assisted with play-by-plays from Andy 'THR Flipmode' Berg. The second broadcast also featured a panel on hosting livestreams, esports careers and brand development with professional gamer Celeste Anderson, broadcaster and presenter Trisha Hershberger, and YouTube content creator Steve ‘SuperGT’ Brown. The quarter-final and semi-final rounds featured 15 races spread across a marathon seven-hour broadcast on Saturday, June 16th. Whilst the second day of action had fewer races overall, with the livestream just over 2 hours and 30 minutes in length, the level of pressure and intensity inside the studio increased as strong drives from ForzaRC’s fiercest competitors resulted in some of the most exhilarating action in the Forza Racing Championship to this date. Past ForzaRC winners G2 Laige and TX3 Lightning started further back in the field than usual, and it resulted in them having at least one meeting on the track as other drivers took over from the usually dominant pair. The result was a surprising, tense and historic battle between AMS RoadRunner and Noble b0x, one which felt like it lasted the entire day. It delivered some of the best ForzaRC viewing to be had, and the final showdown between the pair on Le Mans resulted in a race that wasn’t about who was at the top of the pack, but instead, who between RoadRunner and bbbb0x would finish above the other. An incident towards the start of this final showdown resulted in bbbb0x falling behind, but he stayed in the competition and didn’t lose his competitive spirit. He eventually managed to catch up towards other drivers, but an incident that saw RoadRunner hit into a tire wall and spin-out on the grass, getting stuck on a fence and destroying his vehicle due to simulation damage, meant bbbb0x had a chance to catch up to him and retain the ForzaRC Playoffs points lead – and that’s exactly what he did. For those watching the spectacle in-person, our hearts were in our mouths as we saw it all unfold. But this was it, after many years of competing and pushing himself to the limit, bbbb0x finally had a ForzaRC victory to his name. It was exciting and emotional all at the same time. RoadRunner, who stood atop the podium this time last year at the 24 Hours of Le Mans after being crowned the victor at the ForzaRC Season 3: Porsche Cup finals, would have to settle for second place at the 2018 ForzaRC Series 1 Playoffs. After those tense and unpredictable races, RoadRunner still managed to put on an excellent showing and delivered an incredible performance all-around on the track, and the result for his effort certainly isn’t disappointing at all. 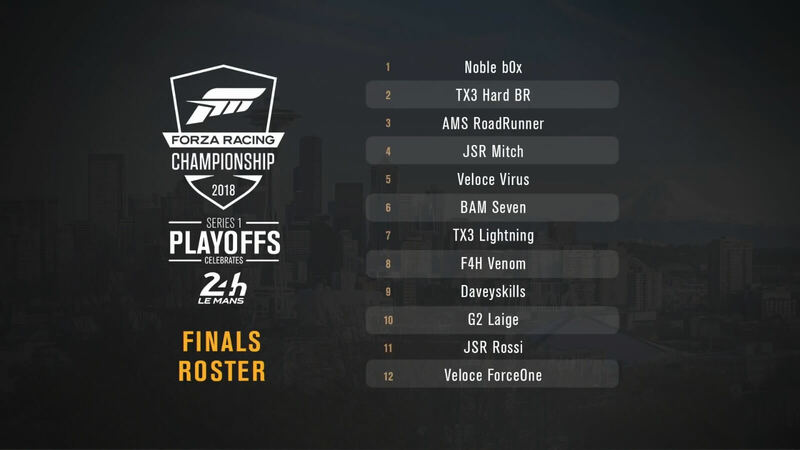 In fact, all drivers who made it to Seattle and especially into the Sunday broadcast delivered some unmissable moments and should be proud of their efforts, but that final battle between RoadRunner and bbbb0x as they aimed for first position on the leaderboard has become one of my personal favourite highlights from the Forza Racing Championship – it was just epic. We also shouldn’t forget JSR Mitch, who quietly emerged as a dominant driver for Japspeed Racing during Series 1. His podium finish in third place proves that there can always be newcomers to the competitive ForzaRC field. This was Mitch’s first offline event and he ensured to make a name for himself before leaving Seattle. His performance on the track and overall result was as surprising as it was merited. 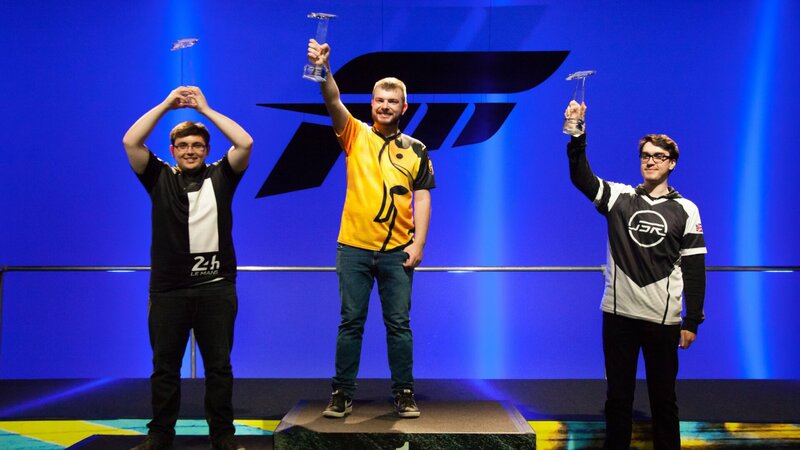 As someone who has worked hard from various organized leagues to professional competitions like the ForzaRC, Mitch is without a doubt well-deserving of his third-place finish. Of course, it’ll be interesting to see whether Mitch will remain as dominant in Series 2 and if he can make it to the podium once more in the next round of offline playoffs being hosted in Mexico City this September. Given his current fifth place position on the 2018 ForzaRC Global Leaderboard, Mitch will no doubt be a contender for the Top 24 in the Forza Racing World Championship finals in London this October – which will most likely be the fiercest and most competitive event so far in ForzaRC history as the best of the best battle it out for their share of $100,000 in the British homeland. However, before we even think about the ForzaRC finals in London later this year, we have Series 2 almost upon us. It begins July 9th with the first Rivals Qualifier event before its corresponding Wednesday Showdown on July 18th. Expect plenty of action from start to finish as the drivers will be working their way towards a spot in the Mexico City offline playoffs as they continue to earn Forza Points and climb the overall leaderboard. With the 2018 ForzaRC Series 1 Playoffs now in the books, drivers will likely take a few weeks off to relax away from the track before heading back into Forza Motorsport 7 for Series 2 next month! Whether it was the tears of joys on an emotional bbbb0x or some of the most exciting battles in the Forza Racing Championship to-date, the Series 1 Playoffs brought us a lot of moments we simply won’t forget about anytime soon. For more on the ForzaRC Series 1 Playoffs, check out the official recap video above and the on-demand livestreams for each day of racing embedded into this article, along with Turn 10’s dedicated playlist of ForzaRC Series 1 broadcasts. Be on the lookout for more coverage from the Forza Racing Championship in the near future, and for a chance to compete or team-up with the drivers, don't miss the ForzaRC Pro-Am Bounty Hunter challenge.